I don’t make the “best ever” claim often, but as something of a Nanaimo bar fanatic, I have tried, and will continue to try, many a Nanaimo bar in many a place, and, call me biased, but I like mine the best. Ever. These are a no-bake recipe that takes a couple steps, making it perfect to work on while you’re baking something else – which is exactly when these got made. When Theo was about 2 weeks old I had the brilliant idea of a mass production baking day with my two local sisters so our freezers would be adequately stocked for Christmas and company. We got smart this time – to increase our haul, we each baked two recipes before getting together so we had 6 recipes done beforehand and could complete at least 6 more together. Meanwhile, my sisters made, cut, and sorted into 3 piles our peppermint bark, peanut butter chocolate Rice Krispie squares, whipped shortbread, fudge, chocolate toffee bars, white chocolate cranberry cookies, gingersnaps, lemon bars, happy cookies, and of course, these Nanaimo bars! You may recall that they had to leave by noon? Yeah, they’re impressive. My goal of stocking the freezer was more than realized, no thanks to me…if only more than 2 things of the 20 some-odd dozen had actually STAYED in the freezer. And also also, sisters are such an amazing blessing…I have 4 of ’em, and every single one is wonderful. All our recipes were doubled since we were splitting them three ways, but these were quadrupled – as soon as Chelsea finished making one giant pan, Sarah sweetly asked if she was “only making one pan?” So Chelsea got back to work and made another. I’m so excited to revisit this recipe to add it to the Canadian Food Experience Project, a project begun by Valerie Lugonja on June 7, 2013. As we (participants) share our collective stories through our regional food experiences and food memories, we hope to bring global clarity to our Canadian culinary identity. 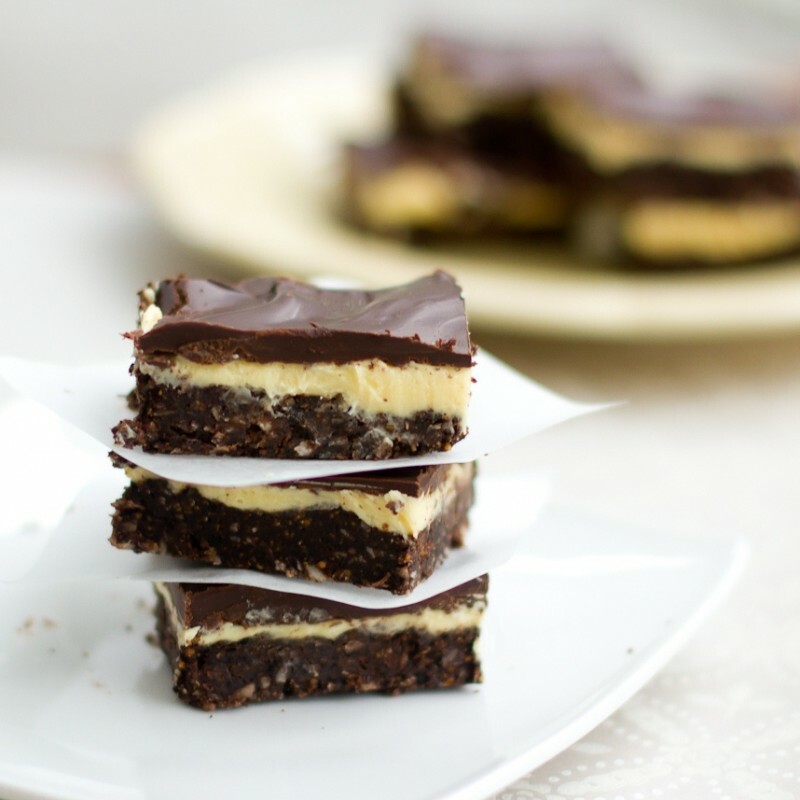 Nanaimo bars are a quintessentially Canadian food that the world is happily adopting, originating in Nanaimo, British Columbia. My family travelled to the city of Nanaimo, on gorgeous Vancouver Island, many summers of my childhood, my parents, their 5 girls, and a big dog filling the van to capacity, the van which then had to haul our trusty tent trailer as well. I have so many memories of the lush scenery, the thickly forested campgrounds, the expansive beaches, and the whale watching we got to experience in and around Nanaimo. When I got married, we spent our brief honeymoon on Vancouver Island as well, and it never disappoints. 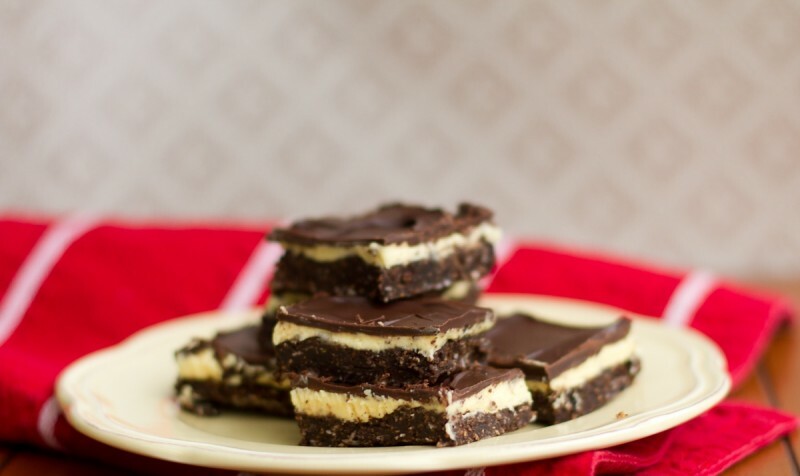 Nanaimo Bars bring all that beauty and sense of belonging and relaxation back, and they are an absolute necessity at any Canadian Christmas, or any time through the year when you just want to celebrate the beauty and freedom of our nation. 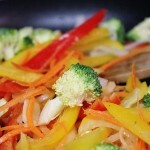 BASE: Combine first 6 ingredients in large saucepan. Heat and stir over medium-low heat until mixture is smooth. Remove from heat. Stir in graham crumbs, coconut, and walnuts. Pack firmly into ungreased 9x13” pan. Chill while you prepare the middle layer. MIDDLE LAYER: Beat all 4 ingredients together in medium bowl until smooth. Spread over first layer. Chill for 45 minutes. TOP LAYER: Melt chocolate and butter in a small bowl at 50% power in microwave. Microwave for about 1½ minutes, stir and microwave another 30 seconds or longer if needed, stirring frequently. Spread fairly evenly over middle layer. Chill for 1 hour, then score chocolate with a sharp knife and return to fridge to chill completely before cutting into bars. I would prefer a thicker chocolate topping…what would be the right ratio of chocolate to butter? I am thinking along the lines of 12-16 oz of chocolate for a 9×13 pan. Thanks. Thanks for the tip on scoring the choco layer. Just made these this week and was wondering how to prevent the top from cracking. Will have to try that next time. Also made these gf which is a nice treat for anyone that cant have gluten. Unfortunately, I seem to have developed an allergy to coconut (much to my dismay) and though I love these and need to make them, I need an alternative to coconut. Thoughts? I was thinking shredded macadamia nuts or maybe rolled oats? Yes, I think rolled oats would work well! Or even just additional graham crumbs. I made these years ago and was given the wonderful compliment of “these are the best nanaimo bars I’ve ever eaten” so thanks for the recipe! I used the oreo crumbs but can’t remember if I left the cocoa out of the base when I did. I plan to make them again in the next couple of weeks – what are your thoughts on if I should leave the cocoa out if I use oreo crumbs? Thank you! The top is a very thin layer of chocolate – there is a bit of squishing of the middle filling, that’s part of the charm :) I’ve never tried peanuts but I think the flavour would be odd in these – I often just omit the walnuts completely, no nuts are necessary! I swap in pecans – so good. So goooood! My non-canuck friends are raving and I’m so happy! Thank you! i was just wondering what type of pan you used? it says 9×13 but is that glass or dark? i have glass but i know that can sometimes change the cooking times so i’d rather use the same type of pan. hoping to make these today. thanks! Just made these, I’m from Ontario but have been living in Kentucky for the last 6 yrs. No one here knows what these are! It’s been pretty cold here, so my 1st layer cooled in the enclosed outdoor porch while I made the custard. I bought Burds custard from the “Imports” section of Krogers. I had no problems, in fact I added a little milk as I watched it whip to make sure it would spread out evenly. Then again, out to the porch and it was set in 1 hour. I did double boiler my chocolate topping and it was a little thin but it’s not suppose to be a thick layer of chocolate, so I am a very happy Kentuckian enjoying my Nanaimo Squares. I’m not sure – I have never had a problem with setting! The middle layer is not a custard, but basically a frosting. Try omitting the milk from the filling, and make sure you use the right amount of confectioner’s sugar/icing sugar, granulated sugar will NOT work. I made these yesterday (the second time in my life that I have made Nanaimo bars). I agree with Kristina in that 8 ounces (227 grams) of chocolate wasn’t enough for the top layer. I used two 250 gram chocolate bars. The resulting top layer was a tad thick but not terribly different to the Nanaimo bars that I have eaten in BC. Perhaps you managed to create a wafer-thin top layer which I was not able to do. Also, I used digestive biscuits instead of graham crackers because the latter are not readily available in New Zealand. With these two alterations, the end result was superb. This recipe did not work for me. 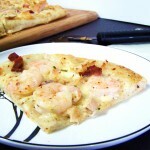 I followed the quanities and found the crust a way to fatty–had pools of butter on top that hardened in the fridge. Because of this, the icing layer didn’t stick. They don’t look & taste awful however will have to serve them straight from the freezer. Have made namimo bars many times using the Nanimo city recipe and never had this problem before. the only thing I can think that was different as I used brought graham crumbs versus crushing my own. I always use bought graham crumbs as well, so that wouldn’t be the issue. The only thing I’ve had that caused that is if the base is fully hardened before adding the icing layer – the base should chill while you’re mixing the icing, but not be completely set. Also, if the butter wasn’t fully incorporated with the rest of the base ingredients it could separate out a bit. The base should be quite greasy, as the rehardened butter is what keeps it together well. Glad they’re still edible, but sorry to hear they didn’t work out great for you! Custard powder is just cornstarch. Look on the ingredients on the custard powder and it says – corn starch. The only thing different is the vanilla. So add a generous helping of vanilla. The best substitute for custard powder in the U.S. is instant vanilla pudding mix. So no, it’s not just cornstarch, and definitely benefits from the other forms of hydrolyzed starch in there. I mean, that’s what pudding is…custard! Sorry, but it is just cornstarch. They call it ‘cornflour’ but the other ingredients are salt (can’t be much), annatto (the same coloring they put in cheeses and margarine to give that yellowish or orange color) and flavoring (vanilla). That’s it. So, just substitute cornstarch, a bit of vanilla and maybe some coloring to make the layer any color you want. When you say chill do you put it in the fridge? I just made these, and they’re on the 45 minute chill. I took some tastes of the ‘icing’ and BOY, that’s a HIT of powdered sugar! I’d say knock it down to 3 cups, and add a few more tbsp of butter to lessen the hit but keep the good amount of the middle layer. Other than that, everything else has worked out perfectly! Updating! When it’s all together the flavours do balance out, but I still believe it doesn’t need four full cups of powdered sugar! Probably still 3 or 3.5cups, and add a bit more butter, and a tiny pinch more of Custard powder. Also, don’t microwave the chocolate, double boil it instead, and make sure you measure out the chocolate/butter proportionately. Microwaving the chocolate had parts smooth and parts that cooked and stayed clumpy. Double boiling is putting the chocolate into a bowl that sits atop of a pot of boiling water, using the heat of the steam to melt. Thanks for coming back to follow up, Amber! I agree, double boiling is a “safer” way to melt chocolate, I just never have the patience with that handy microwave right there :) Glad you enjoyed them! My family made these with bitter chocolate on the top. No sugar in it whatsoever. The bitter chocolate cut the sweetness of the middle layer perfectly. 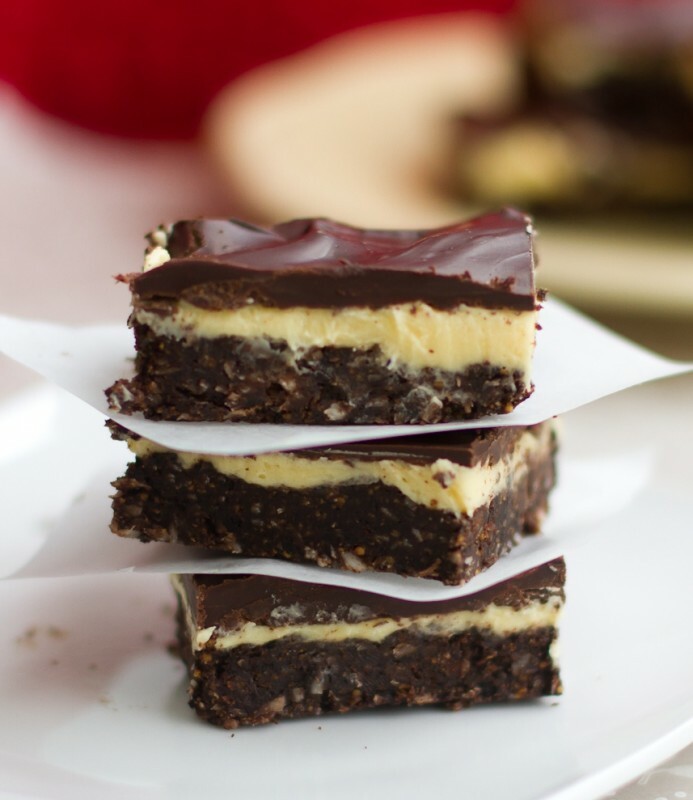 This is still my preference and what I think of as the perfect Nanaimo Bar, although I have yet to find a recipe that doesn’t use semi-sweet chocolate on the top layer. These look delicious! Question…its hard to find custard powder where I live, is there anything I can subsitute it with? Thanks, cant wait to try them! I’ve never tried substituting anything, but I’ve heard you can substitute instant pudding powder or just flour for a similar result – it’s a bit of a thickener and gives the icing it’s yellow colour, though, so I’m not sure exactly how the taste and colour would be affected. Let me know if you give it a try! Made this recipe last week. You’ll have to scour the bakeries next time! A lot of places in Vancouver sell them as well :) Glad you liked them! I use jello pudding powder instead of custard powder – the only difference is that it makes it white instead of yellow. These really are good. I’ve been looking for years to find something that didn’t taste sickly sweet and that you could taste the cocoa in. 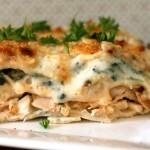 This is by far the best recipe on the net! Hello! I really would like to try these, but 35 is a lot! If i halved the recipe, do you think it would fit into an 8×8 pan? Butter vs margerine? If butter, salted or unsalted? Same question for your whipped shortbread. Now they sound really yummy! For the whipped shortbread, butter only, not margarine – and I always use salted butter. Either butter or margarine works equally well in the nanaimo bars, salted or unsalted doesn’t matter! I almost always use salted, but in this recipe it doesn’t affect the flavour either way. I am a Canadian living in Oz for 15 years and can’t wait to serve this delicacy to my Aussie family this Christmas. I’d forgotten how wonderful this treat is. Bang a bit of condensed milk in if you are feeling really moorish! Go Canucks!!! I am so trying these out for the holidays! I just went out and got all of the ingredients this morning. I’m waiting to see how they turn out but, sorry Anna, I think I’ll go back to my original recipe. For the base layer, the butter separated and now I have puddles of butter on top of my base. I think it was maybe because the egg coddles when you cook it and that there was 1/4 cup more butter than in my original for the same amounts of ingredients. I think it’s better to add all ingredients (butter melted) into a food processor. The middle layer is much easier to get to the right consistency if you first cream the butter, custard powder and vanilla (I needed to add 1 tsp for it was too dry) and then add the icing sugar and milk (I use Baileys) alternately in batches. Now just waiting for the middle to cool and then I’ll try the 3rd layer. Hopefully it will all come together and the butter puddles will blend in. I love love love nanaimo bars, but am not a “baker” so I’ve always thought I couldn’t handle this. 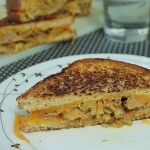 The recipe was simple, easy to follow and turned out amazing! I just wanted to note that between everything, I put the pan in the fridge and not the freezer. That made it super easy to cut into pieces. I’m doing a little christmas baking. -25C outside. Chilly weather works great as a freezer for chilling really fast and cutting down production time to 1 hour. brrrrrrr. Recipe is fast and easy. I didn’t have enough milk chocolate so I swirled callebaut white and milk chocolate on top. I’m not sure what I did wrong I hope you can help me but I added the first 6 ingredients and it looks like the mix seized on me I’m not sure why?? Please help. Thank you. I’m not sure either – there shouldn’t be anything in there that would cause it to seize, since you’re working with cocoa, not solid chocolate…did you make any substitutions? Best base I have ever tried. Didn’t crumble everywhere, and it was just the right amount. I use a completely different middle layer though, my Mom always used a caramel, and put a pecan on top, called them island bars as a variation on the traditional one ;) But other than the middle, I have completely adopted your recipe now. For anyone who wants to try it, just take two 14oz cans of sweetened condensed milk and cover them with water in a deep pot. Bring to boil, then put on low to simmer for 4 hours (keeping them covered with water). Spoon out of cans and spread out as the middle layer. Sticky tasty goodness. Ok, I need to try that asap – I LOVE the caramel pecan combo! Thanks for your comment, Rachel! I love your website…thanks for helping a newbie in baking. i just want to ask if what kind of coconut do you use here? fresh (soft) coconut? coconut that’s use to get coconut milk, desiccated? if using fresh coconut, will it spoil easily? i also would like to ask, if you will put the base in an ungreased pan, will it not stick? or is it helpful if i will put wax paper? to easily pull it out of the pan? or no need since the whole nanaimo will not stick? thank you again. Hi Angie, I use desiccated/dry shredded coconut, I’ve never tried it with fresh. There’s no need to grease the pan – the butter in the base of the squares takes care of that and they come out very easily. Hope you enjoy them! thanks! i will try them tonight. How about the substitute for the custard powder (is it really powder in form)? im in the philippines, and i think i can’t find custard powder, but in the internet, i can substitute it with the mixture of cornstarch, milk, vanilla, sugar and salt. if ever, do i need to cook the custard first before combining it with the other 3 ingredients (butter, milk, & icing sugar)? thanks again. It is powder – I’ve never used a substitute, but others have used the powdered instant pudding mix. You should be able to find custard powder in the baking aisle at most stores – it’s yellow, which gives the filling its yellow colour. Hmph. Not sure what happened but these definitely didn’t come out the way they were pictured. I used an entire bag of chocolate chips (semi-sweet) and let the second layer sit for more than an hour in the fridge and the chocolate layer is more like a swirl on top rather than an actual full layer. Wouldn’t 12 oz of chocolate chips be more than 8 oz of baking chocolate? Hmm, I’m not sure why the chocolate wasn’t enough – it isn’t a super thick layer, but it’s definitely enough for a solid coating. Sorry I can’t be of more help! These look amazing, I can going to try them as soon as I go shopping to get ingredients! Nanaimo bars are one of my favorite!! I will have to try these. I love the team work as well. I forgot how much I love Nanaimo bars. *Thanks for reminding me! * :D Yours do indeed look like the best. Ever! These are great! For the americans in the group- I used instant vanilla pudding powder instead of powdered custard because I couldn’t find it here in Ohio. And icing sugar is the same as powdered sugar. I also ended up using a bag of mini chocolate chips instead of the baking chocolate for the top layer. These were a hit at work, we had a Xmas back off and these won for the tastiest! So glad you liked them and they were a hit! Thanks for sharing the tips, I didn’t know vanilla pudding powder would work but that’s a great idea! I saw these in a magazine a while back and cut out the recipe but I still haven’t made them. They look so yummy, especially that big thick layer of chocolate on top! Oh boy do these look good!! I’ll take a whole tray please!! Curious…what is custard powder & wear do you buy it? 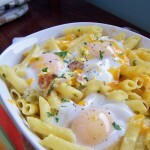 Never heard of it but these look really good, easy and delish! Thanks! These look so fantastic!!! And addicting!